Last night I received the most lovely package of precious samples. The idea was for a gift box made up to celebrate Valentines day with your cat and dog. Included in the gift pack was a 5oz can of Evanger’s Super Premium Seafood & Caviar Dinner. Well, we couldn’t wait till February to taste test this gourmet selection. Verdict – delicious. Considering my cat Stinky, ran across the room when I opened the can and simply gobbled down every last bit. It surely is a cat favorite. Now. 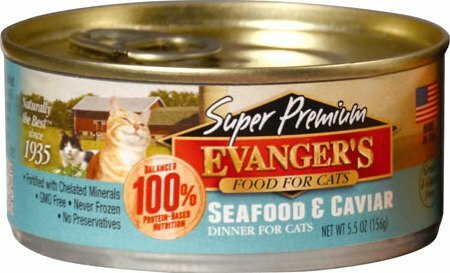 what I like is that Evanger has been making super premium dog and cat food for over 70 years, and right here in the USA. When they say “super premium” its not a marketing ploy, its the truth. The first ingredients are Salmon and Chicken. I especially like how there is no corn or gluten in the product thus my cat enjoys a high protein meal. The cost for such a gourmet luxury is not much about 99 cent per can. I recommend buying the product online. An online retailer like Paw Naturals: www.pawnaturals.com has the entire menu of Evangers, plus one of the best selections of all natural and healthy products for your cat and your dog.